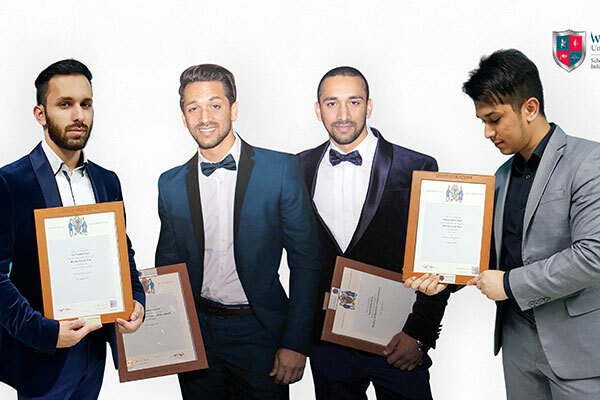 The four siblings of the Salim Kazi family donned graduation robes at Westford University College in the United Arab Emirates, a transnational education partner of the University of Wolverhampton. Twins Saad and Salman the twins are now 26 and enrolled for the University of Wolverhampton Masters of Business Administration (MBA) at Westford University College in 2013, graduating in 2016. They inspired their younger brother Saif, now 23, to join University of Wolverhampton BABM at the same institute in the same year. Seeing all the three brothers studying for their degrees together, their youngest brother Sahar, 22, was inspired to follow their footsteps too, completing his studies in 2018. Sahar said: “I trusted my brothers’ choice of University and joined without thinking much, and today looking back I feel it was the best decision I made. The entire journey has been a wonderful learning experience and a great development phase for all four of us. To be taught by the same professors at Westford University College that had taught my elder siblings and to graduate from the same University as them is a moment worth reliving. Today these four brothers are excelling in their respective careers as Project Controller, Finance Management, Insurance and Purchasing Coordinator.